After nearly 5 weeks of no reports of any Southern Resident Killer Whales (anywhere, not even just here!) we were all relieved Sunday morning to get the early morning report from out west that J-Pod was heading back in. They were still several hours away, but it was hard to sit still, especially on such a beautiful spring day! 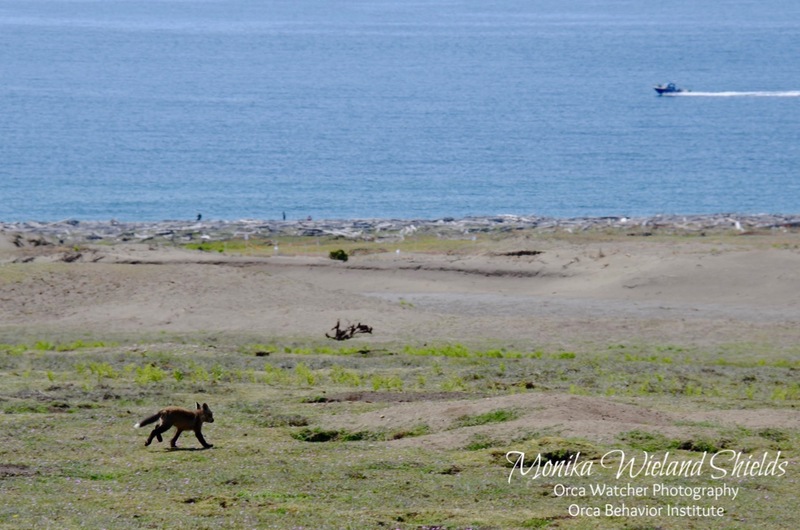 So we passed some time by heading to the south end of the island where the multiple fox dens with their plethora of kits are another main attraction this time of year. 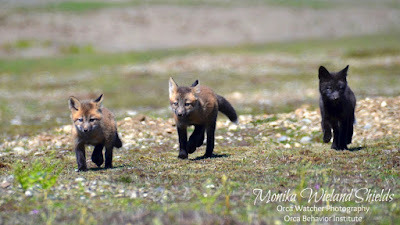 Watching these guys frolic across the prairies definitely helped pass the time! 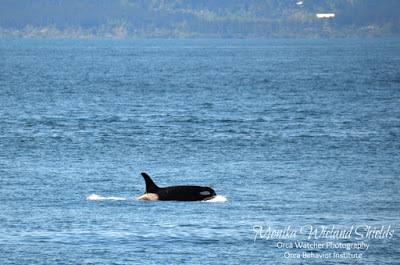 In the early afternoon we headed up to Lime Kiln and watched as the whales rounded Discovery Island and made their way across the straits. With so many changes in J-Pod last year due to the loss of five of their members, many questions hang in the air. The first and foremost on everyone's mind was: would everyone else still be there? I'll avoid the suspense and say now that the answer is YES. 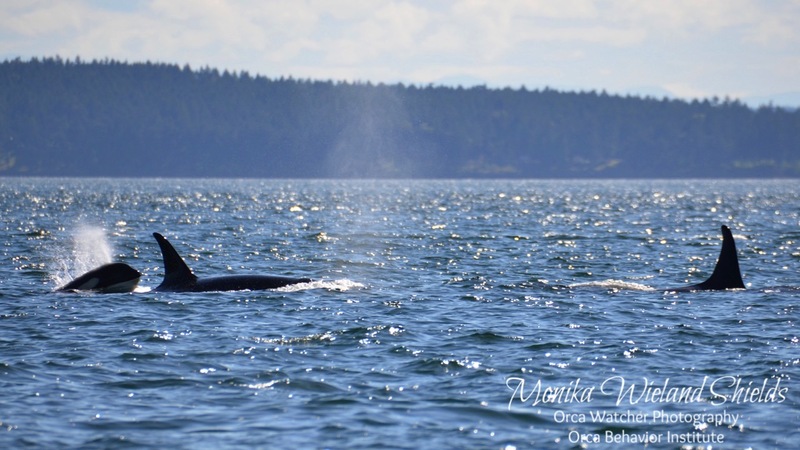 We saw members of all family groups and identified nearly everyone as they passed Lime Kiln, but a few whales were too far offshore to ID. 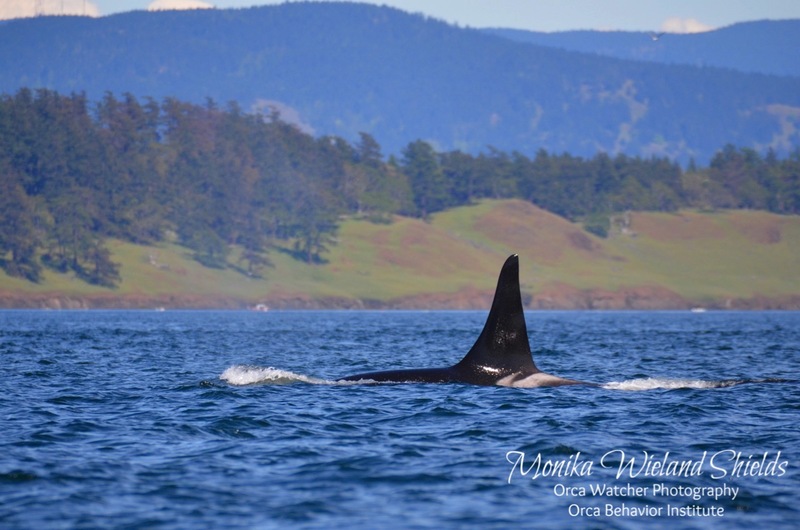 Thankfully today the Center for Whale Research posted their encounter update confirming everyone was present. Another question is what will happen in the wake of the death of the matriarch J2 Granny, who was so often in the lead. Will someone will her role? Will travel patterns and association patterns change as a result? We at the Orca Behavior Institute will be diligently taking data this summer and beyond to help answer questions like these, but on this day, it was J19 Shachi in the lead. From a human perspective, Shachi seems like a good candidate to take a leadership role for J-Pod. 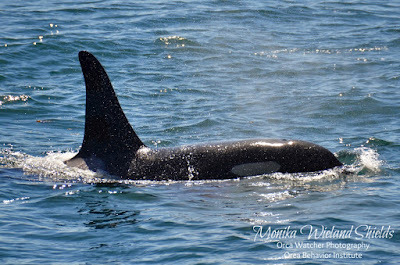 She was a regular traveling companion of both J2 Granny and J8 Spieden, including in more recent years when J-Pod started splitting into smaller groups. But only time will tell if this will be a regular role for her, let alone a permanent one. Not too far behind Shachi I was happy to see J41 Eclipse, my personal favorite, with her son J51 Nova. 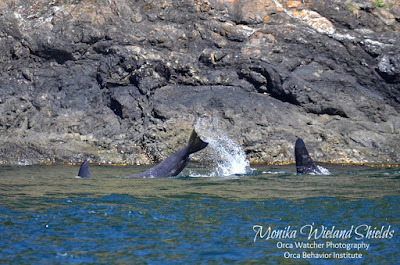 There was a short gap after these matrilines passed by, but we could see blows in the distance to the south and knew the rest of the whales were on their way. 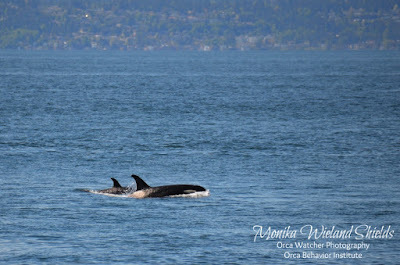 Another question for this summer is what will become of L87 Onyx, the whale born into L-Pod who has spent several years traveling with both K- and J-Pods. 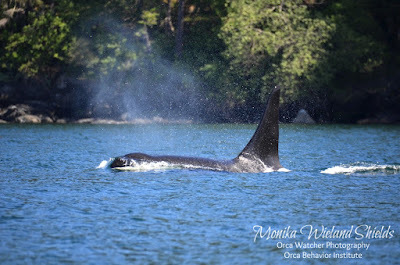 As his closest traveling companions (elder females from each pod, most recently J2 Granny) have passed away, he's moved on to associate with different whales over the years. Will he stay in J-Pod? Who will he latch onto? The J14s, J16s, and J22s made up the second group, and for today, Onyx was with them. 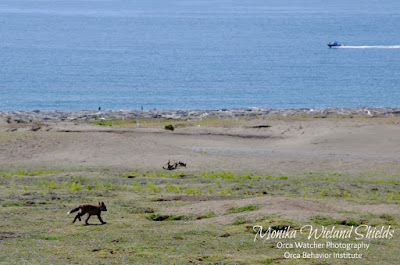 Specifically, he and J38 Cookie were the trailing whales, passing much closer to shore than anybody else. I couldn't believe how much Cookie has grown over the winter! We hopped on the boat to meet up with the whales again near Mitchell Bay. 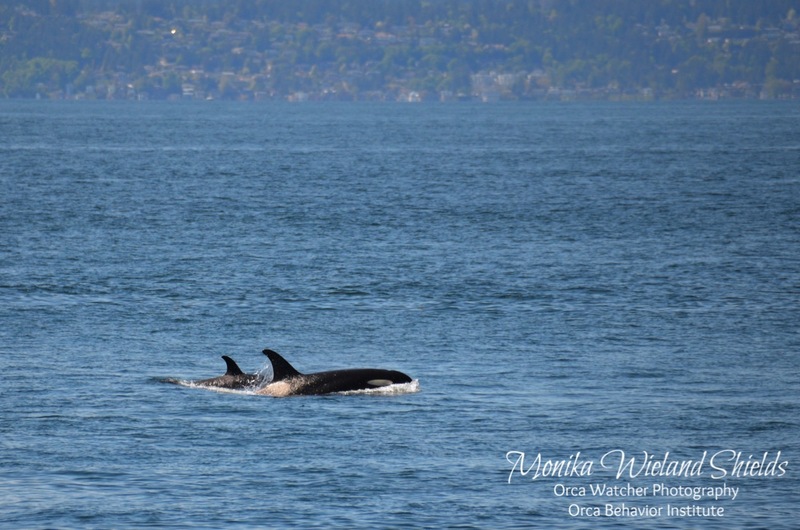 First we hung out with the J16 family group some more, and then dropped back to see who was now traveling with Onyx and Cookie. 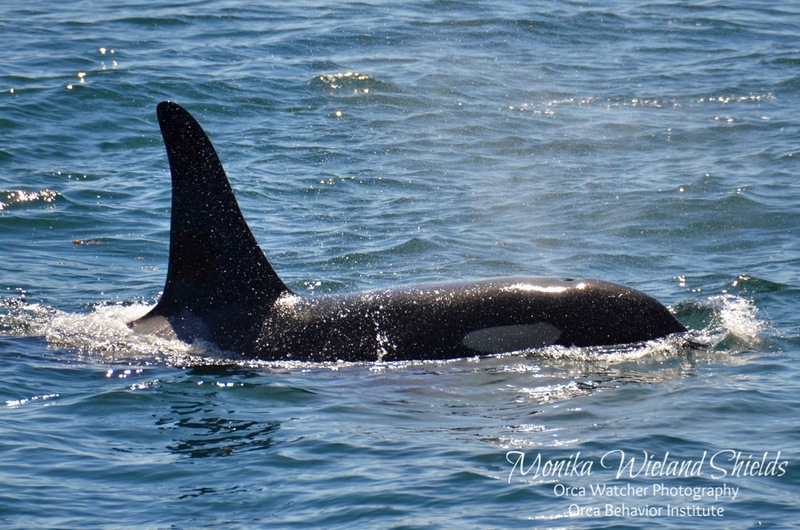 The answer was J45 Se-Yi'-Chn and J49 T'ilem I'nges, two other young J-Pod whales. This group, who was in a playful mood, is interesting for several reasons. 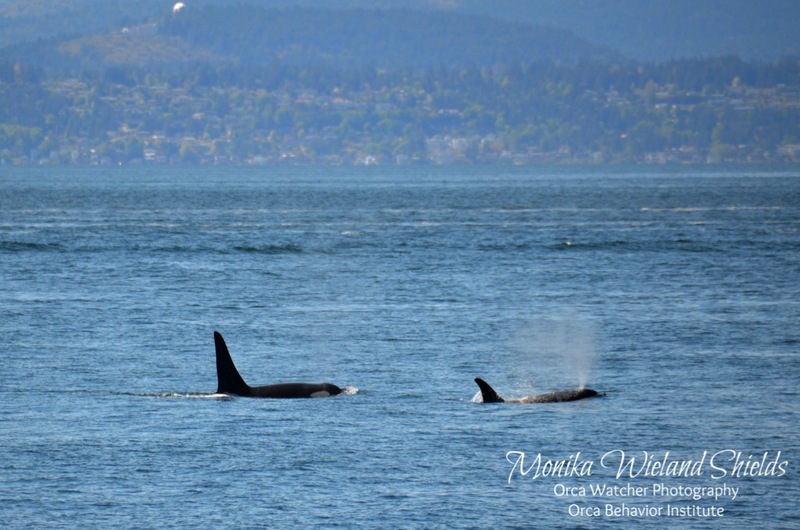 Not only are they all males, but they all lost somebody last year, with the passing of J2 Granny, J14 Samish (mother/grandmother to J45 and J49), and J34 Doublestuf (brother to J38). With their families broken by their losses, are they finding solace in one another? These are the kinds of questions we will never have definitive answers to, but we can hope the answer is yes. After a little while Onyx fell back from the others, and we stuck with him. Unlike many whales when they're traveling on their own, Onyx doesn't always stay in just travel mode. It was the same on this afternoon, when he started doing tail slaps and dorsal fin slaps all by himself. If his story isn't enough to make you like him, his behavior usually is! L87 Onyx - the whale who breaks all the "rules"
As the whales continued on towards Turn Point, we split off to head for home, but not before getting one last look at the J16s who were grouped up offshore. Our next question about the whales was: after such a long absence, would they find enough fish to stay? 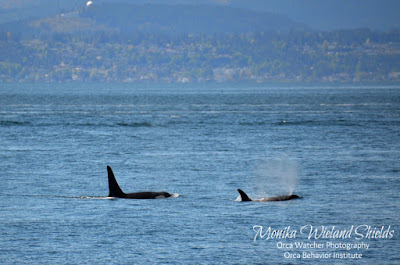 Our encounter with them was on May 7th, and on May 8th they were seen by others up north. Presumably they're still up there today, and hopefully finding a lot to eat! Just like in all things, what goes up must come down, so as long as the Js are up north, we've got a chance to see them again on their way back south! 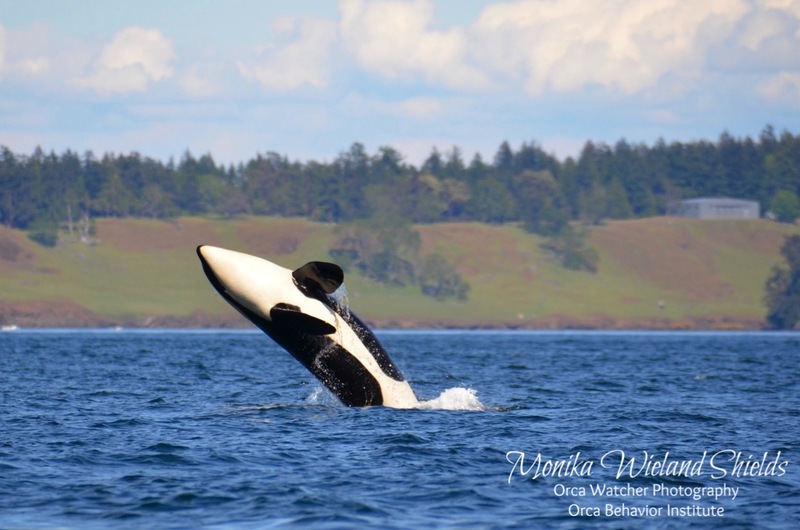 After getting such a great "whale fix" to start the season, we're definitely ready for more! All good news. I am hoping this will be an exciting season for you guys. Thank you for such a wonderful update. Thank you for such a great update! I just received your book from Amazon and can't wait to sit down with it! I LOVE orca's! 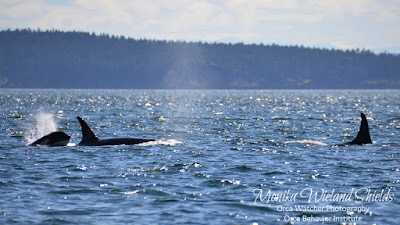 Have only gotten to visit the San Jaun islands once, it was a dream come true seeing the orca's in the wild! I have missed you...I guess I need to catch up on your blog. I am curious and maybe you touched on this. 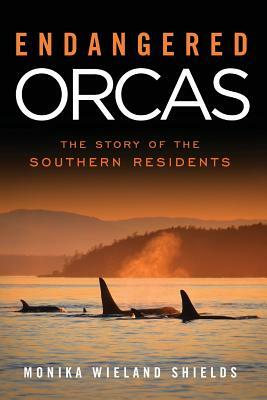 How do you find out that an orca dies? Do they go and search them out? Doreen, I hope you enjoy the book! And yes, the San Juans are a very special place indeed. Kate - it's rare for a whale's body to be recovered when it dies, although there have been several occasions when one washes up and a cause of death may be determined via a necropsy. 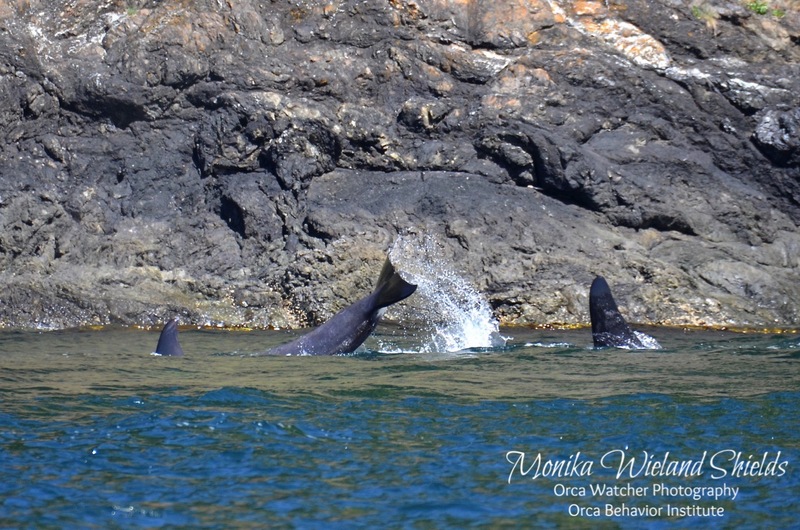 More often, we simply don't see that whale with it's family group anymore. With the Southern Residents especially, family bonds are tight, as offspring stay with their mother for life. We do see pods splitting up more often, but it's rare for a matriline to separate. If a whale isn't seen with it's family for several consecutive sightings, it is presumed to have died.